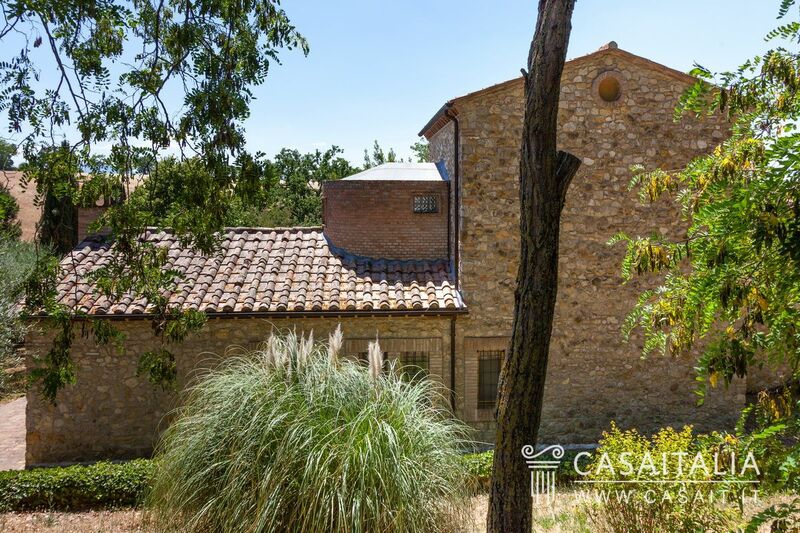 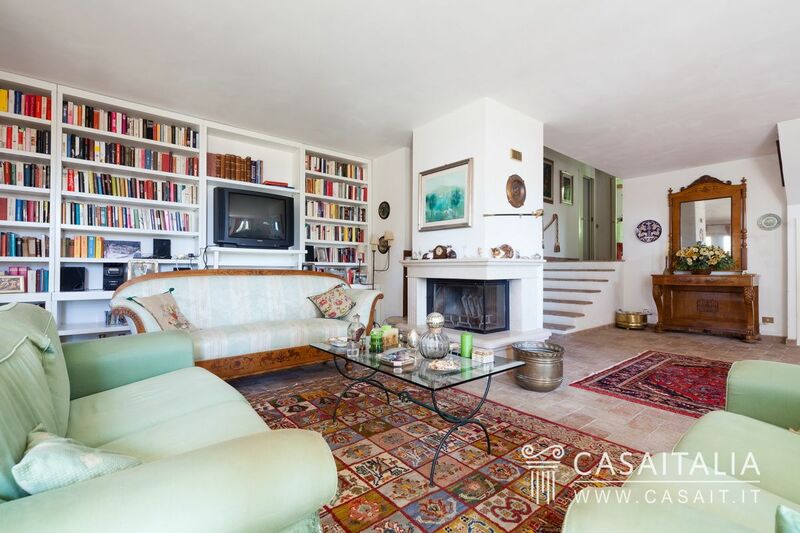 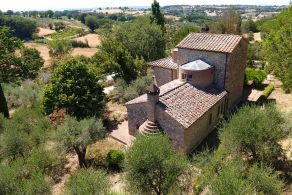 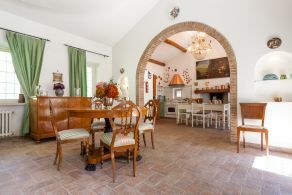 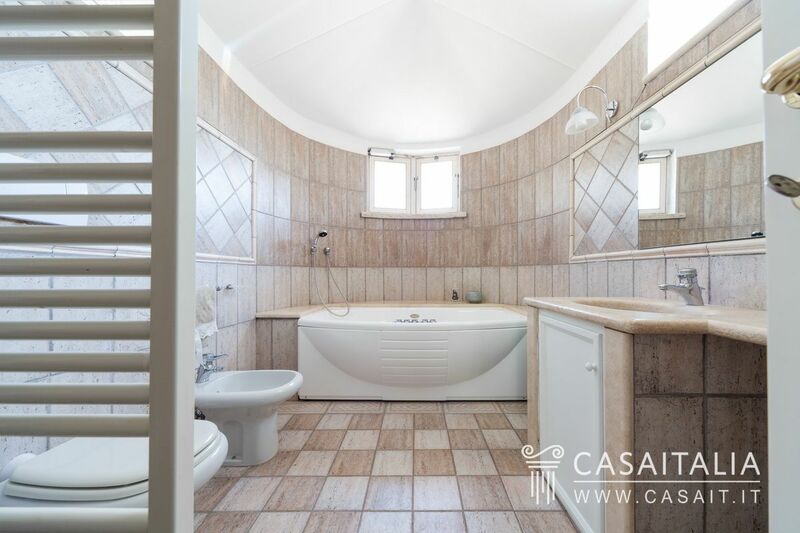 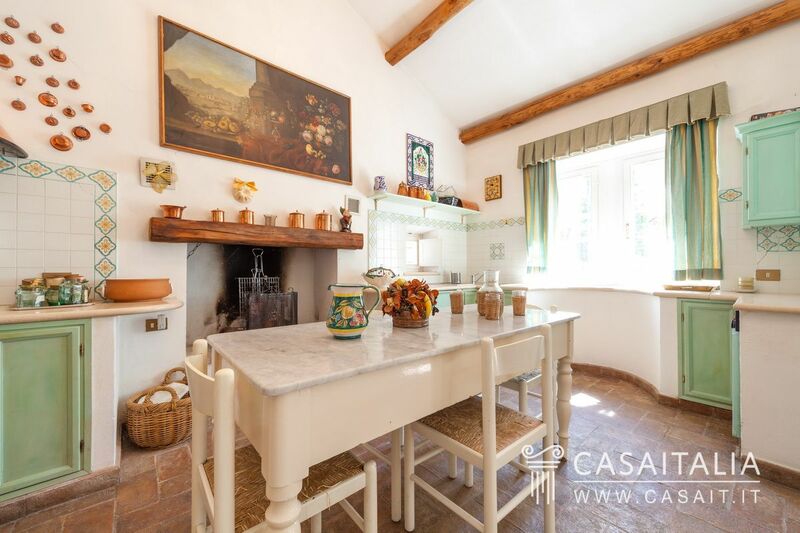 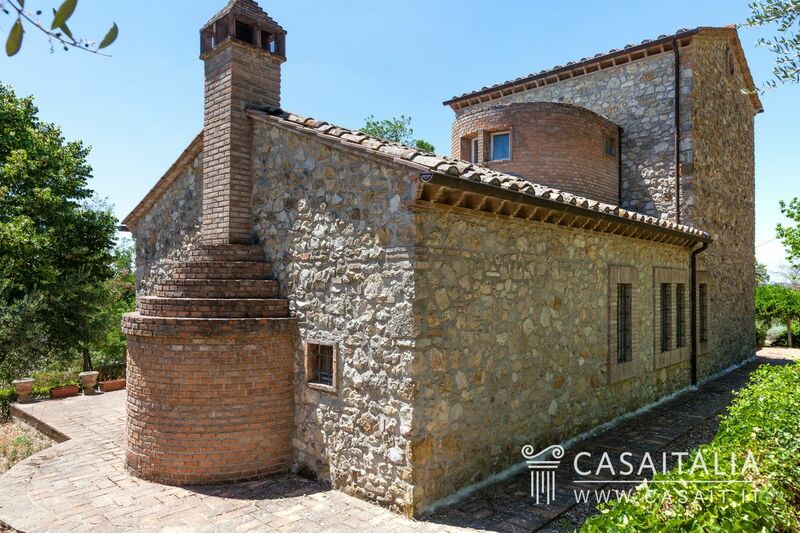 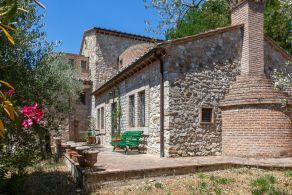 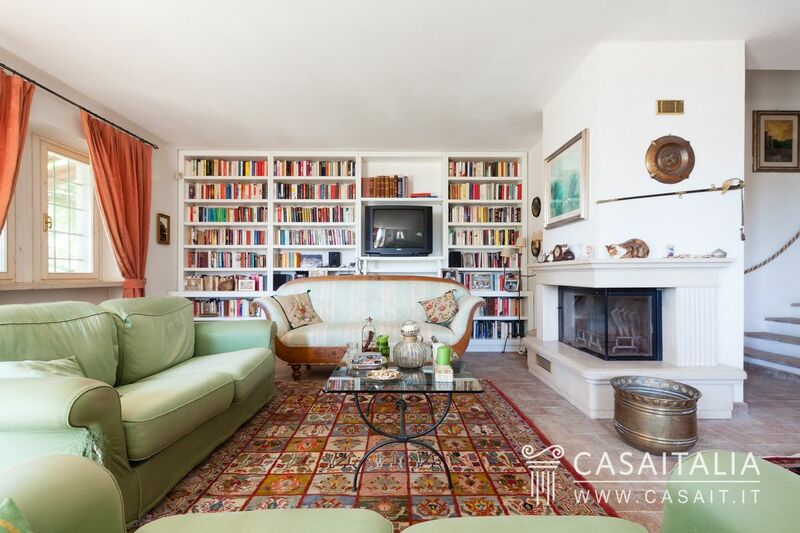 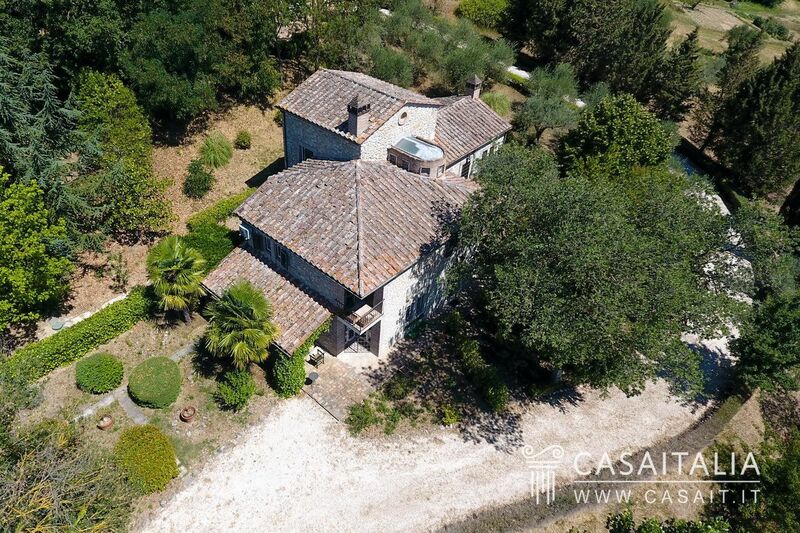 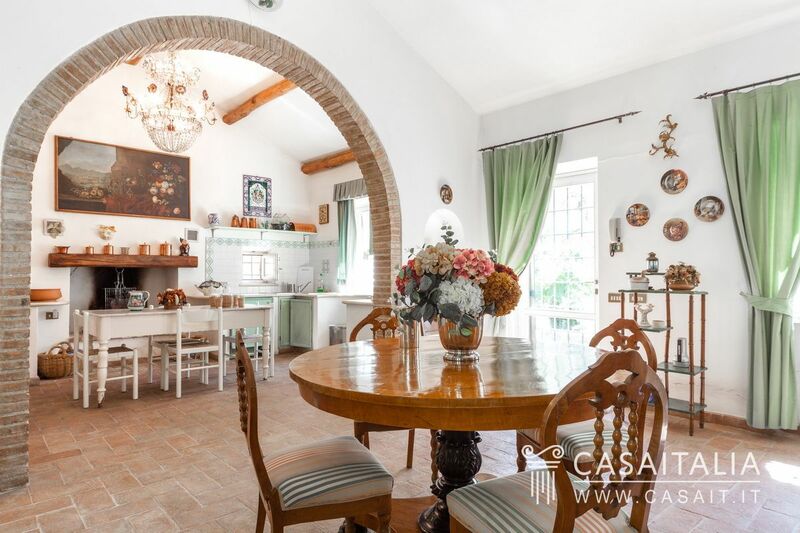 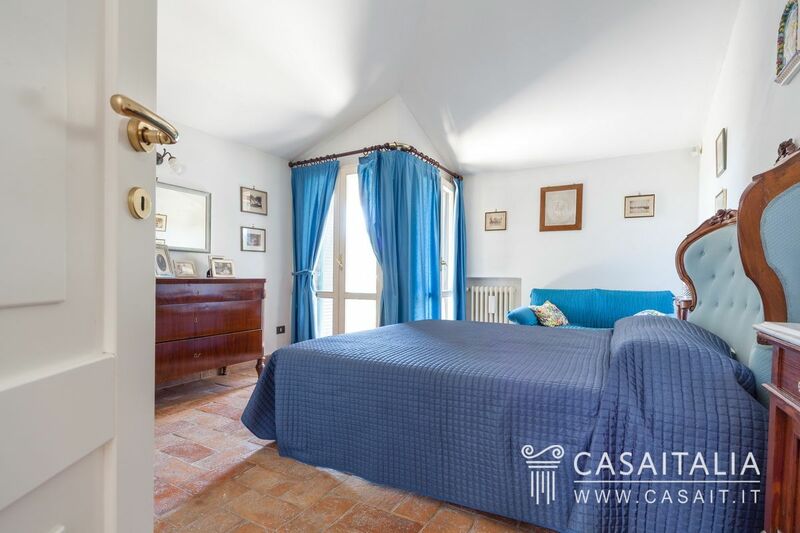 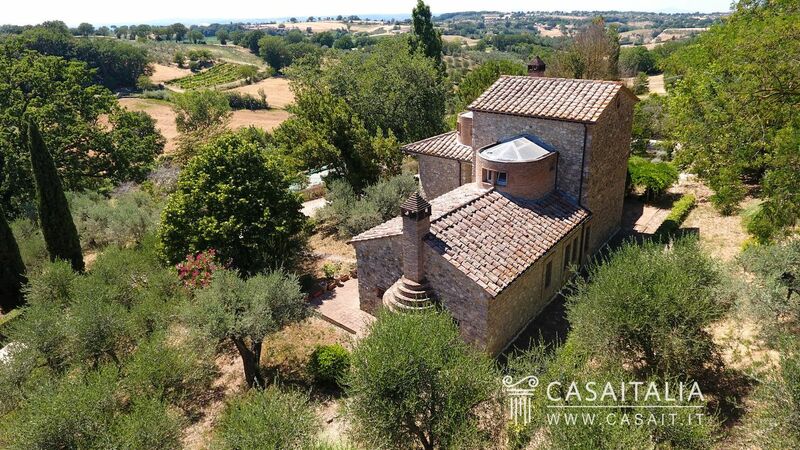 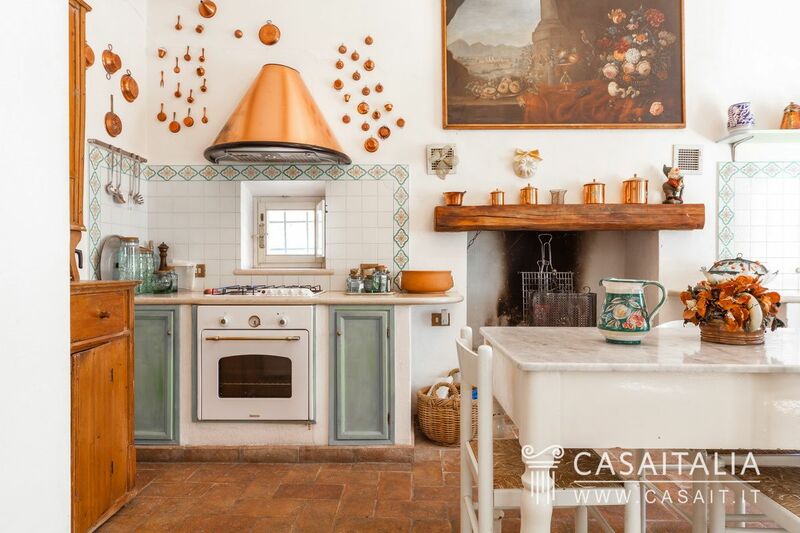 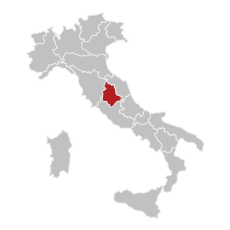 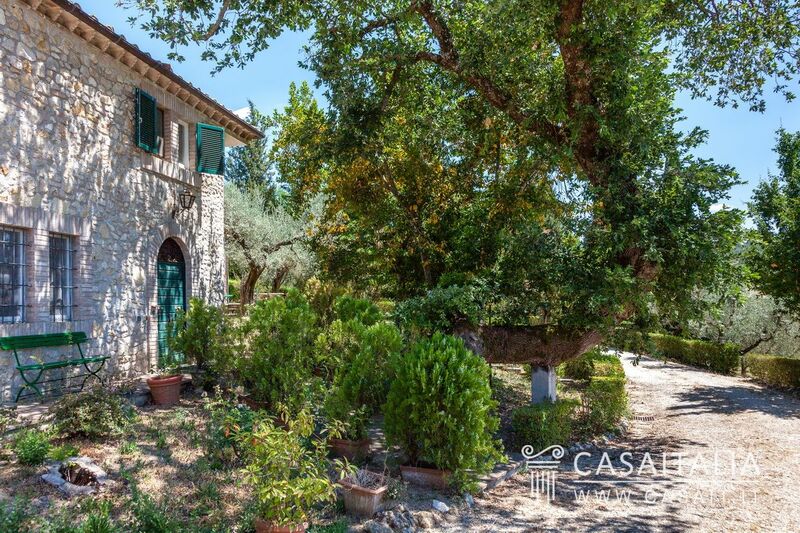 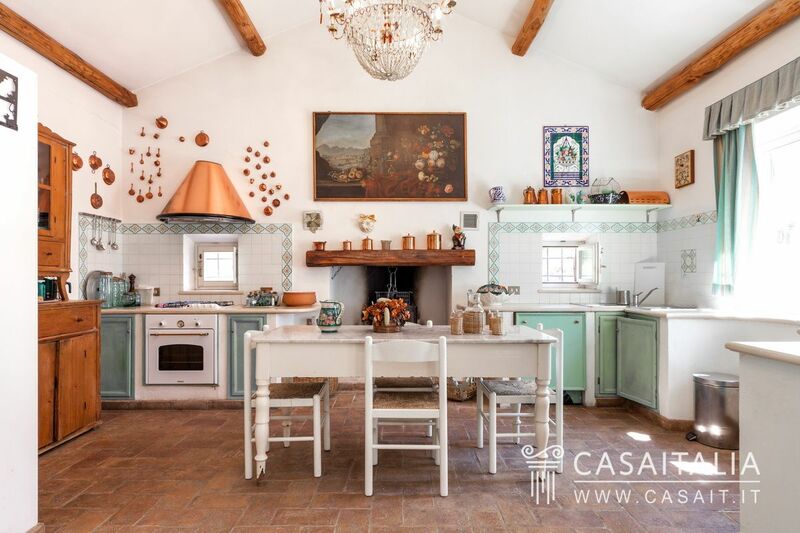 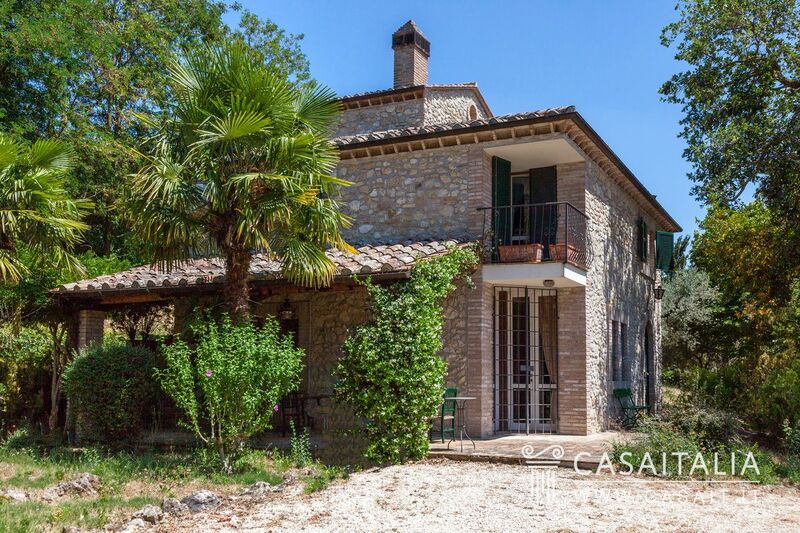 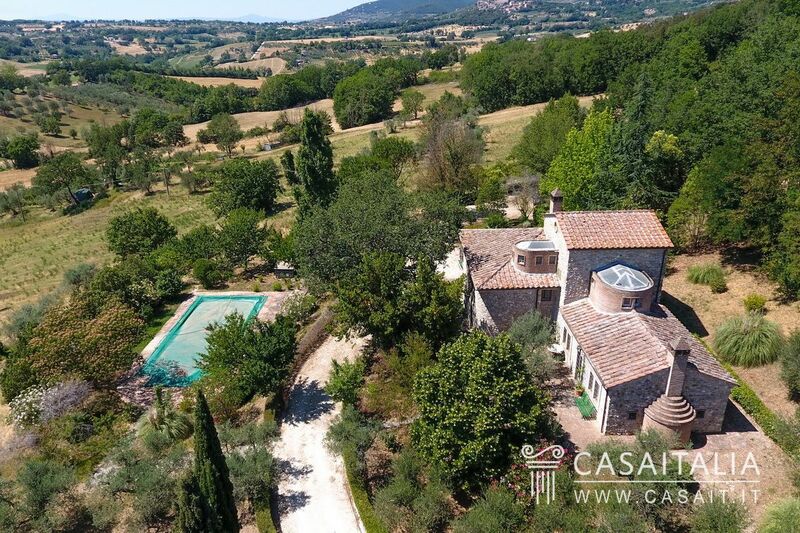 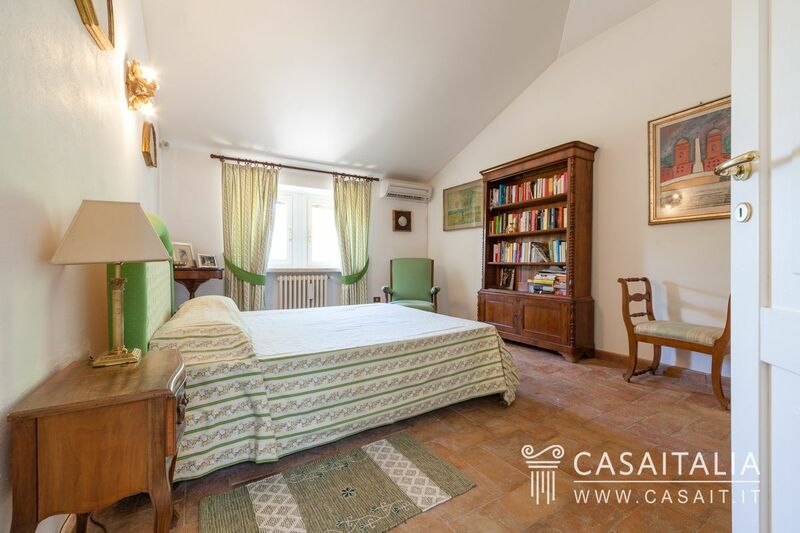 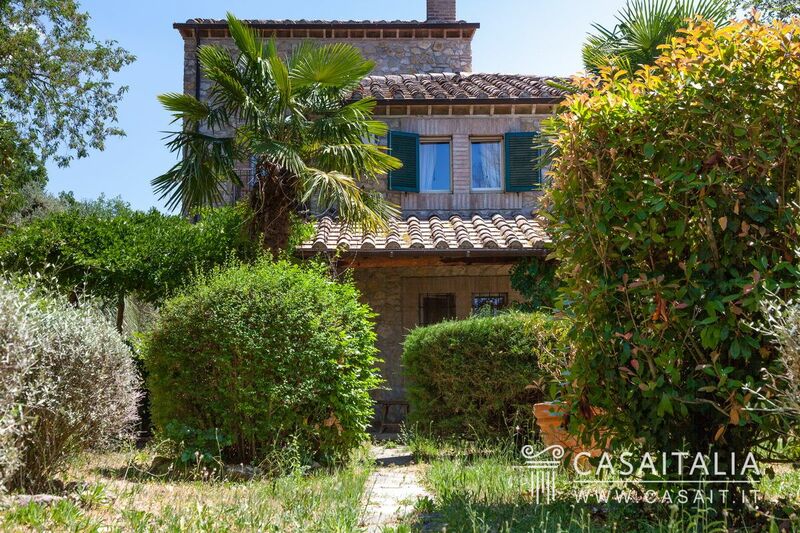 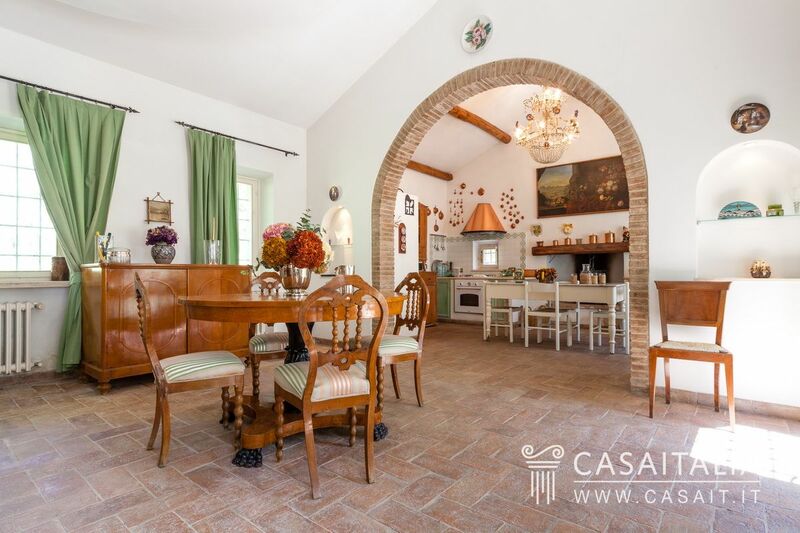 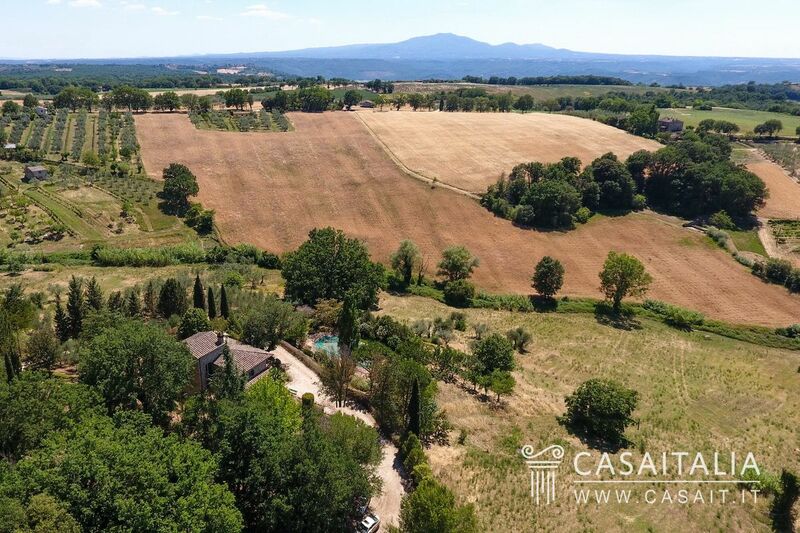 Casale il Quadrifoglio is for sale just 1.5 km from Porchiano del Monte, a picturesque Umbrian village on a little hill, among the woodlands and countryside. 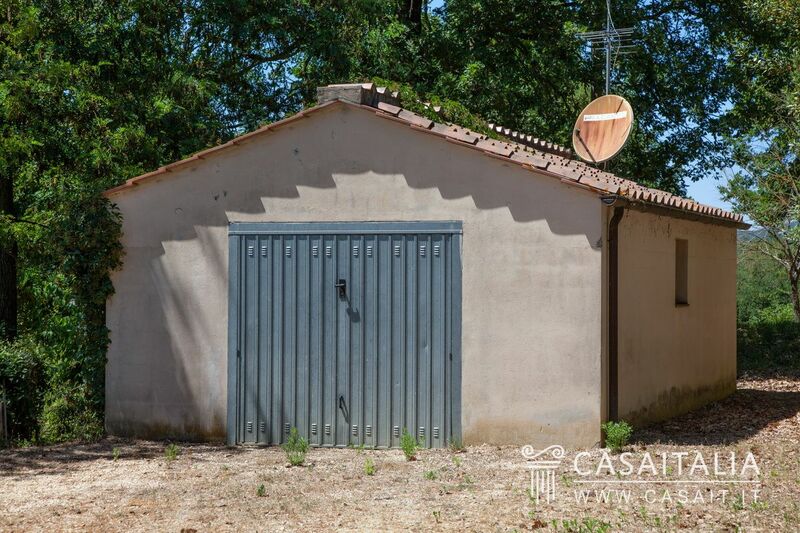 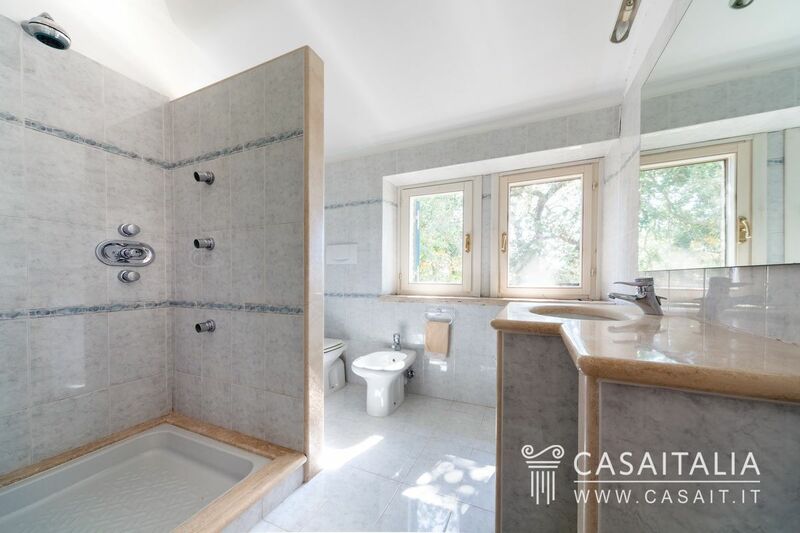 The property comprises the house, measuring 285 sq.m in total and an annex used as a garage, measuring 38 sq.m in total, surrounded by around 3.7 hectares of private land with garden and swimming pool. 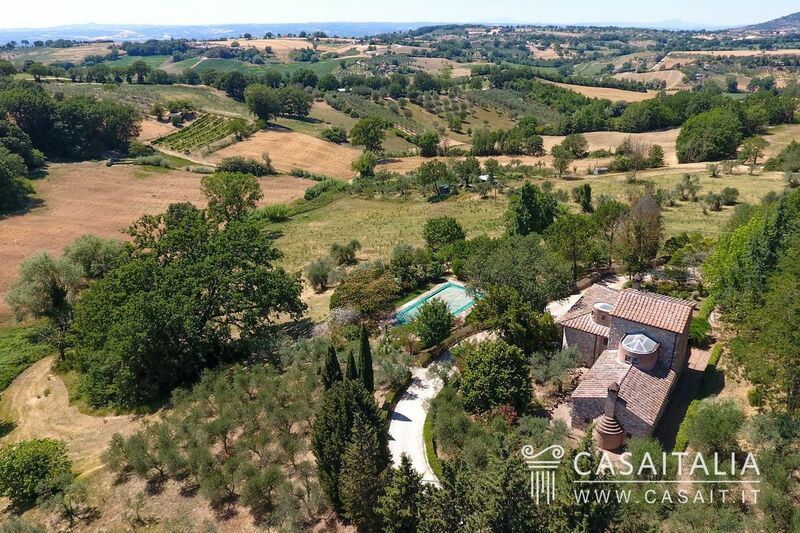 The location is panoramic and convenient, a little over an hour’s drive from Rome, easily accessible via the A1 motorway, 12 km away, and less than an hour and a half from Central Italy’s main airports: Perugia, 100 km, Ciampino, 111 km and Fiumicino, 128 km. 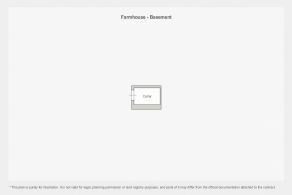 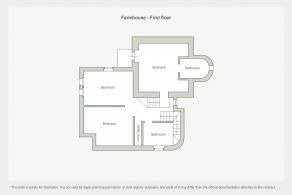 The house measures 285 sq.m in total over 3 floors: the ground floor entrance opens into a large living room with fireplace, with access via a few steps to a sizeable dining area with open kitchen and fireplace. 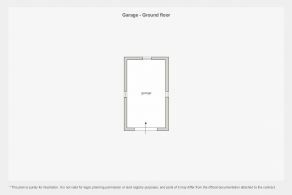 On this floor there is also a bedroom, currently used as a studio, and a bathroom. Outside, a pretty porch overlooks the garden; an ideal place to enjoy the fresh air when the weather is warm or for outdoor dining. 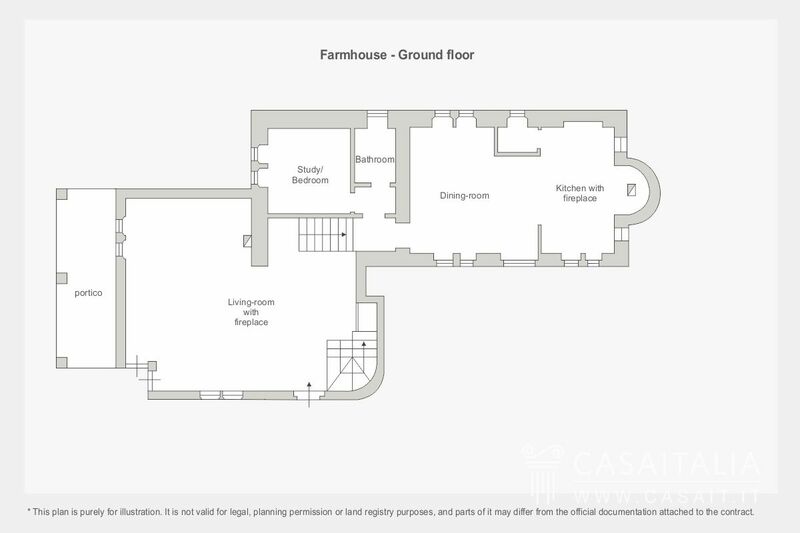 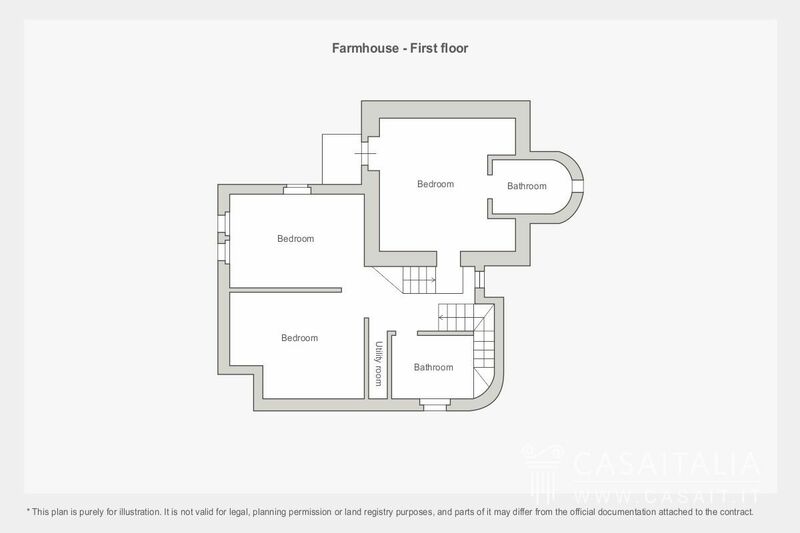 The sleeping area is on the floor above, with the master bedroom with en-suite bathroom and two further large bedrooms (one with fireplace), a bathroom and a store cupboard. 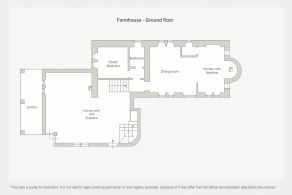 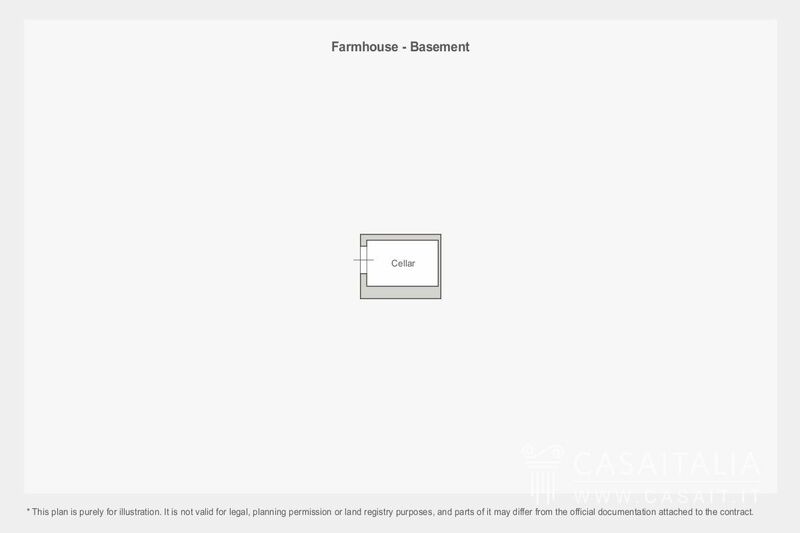 On the basement floor there is a little cellar measuring around 7 sq.m. 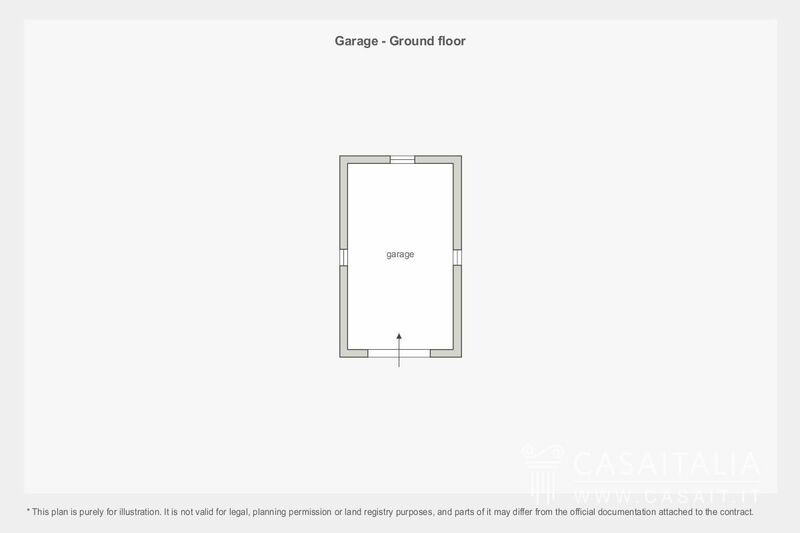 Not far from the house there is an annex, measuring around 38 sq.m in total, for use as a garage. 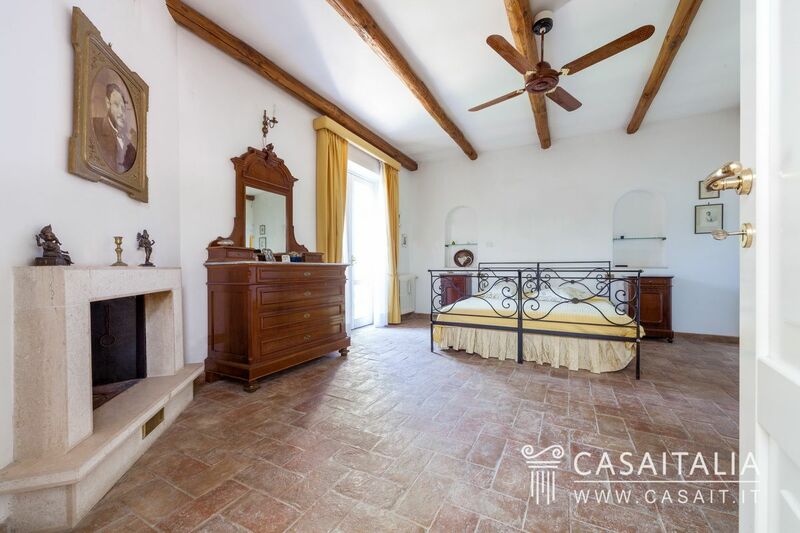 The property has been restored and is in excellent condition. 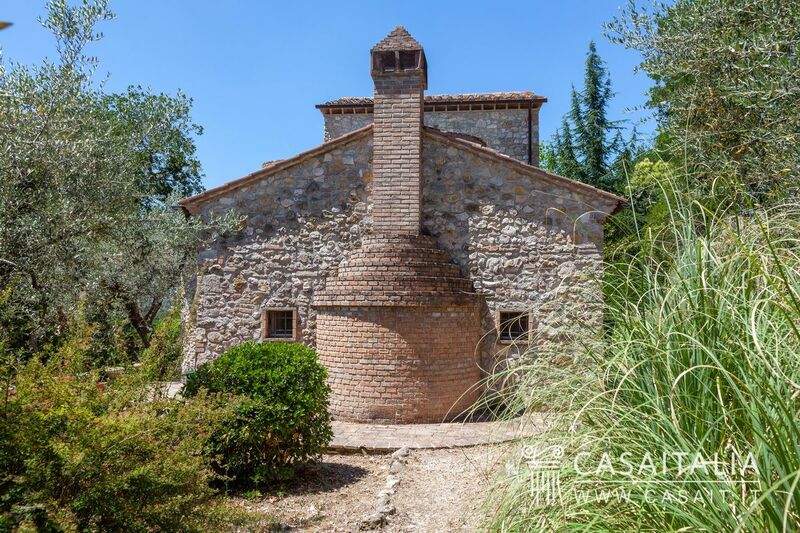 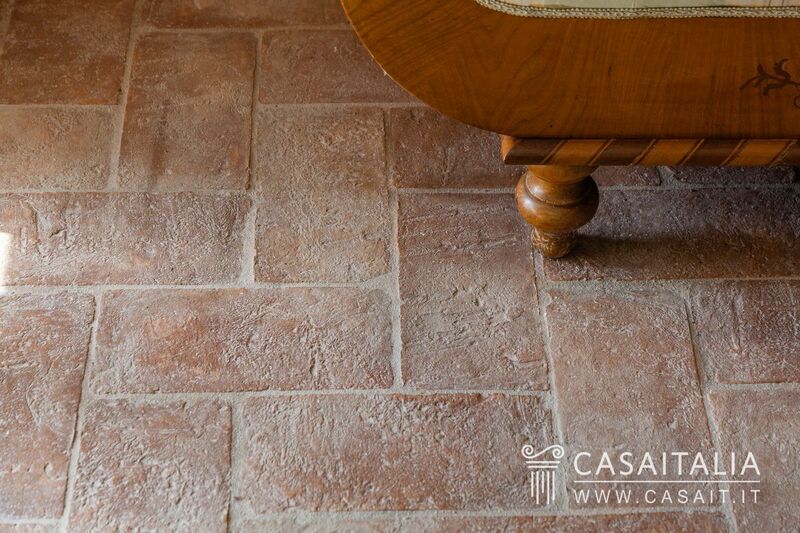 Inside there are traditional finishings, such as tiled floors and 3 typical fireplaces. 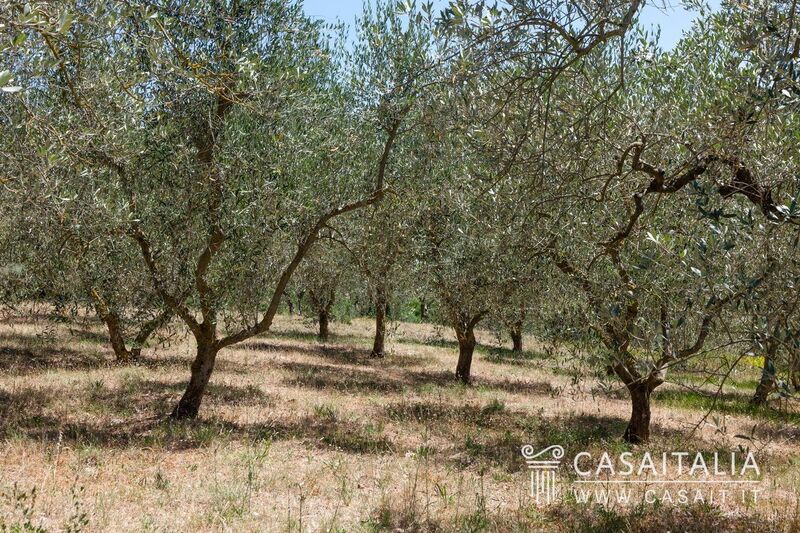 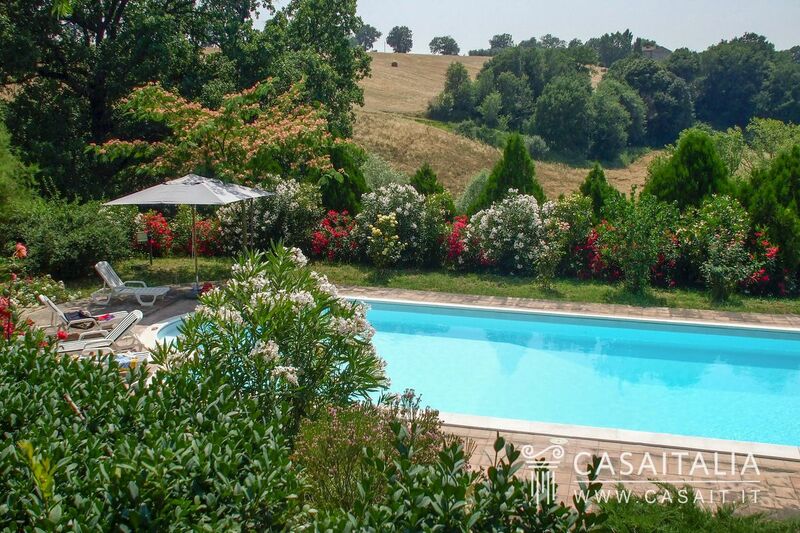 Il Casale del Quadrifoglio is surrounded by 3.69 hectares of private land, with pool and small olive grove. 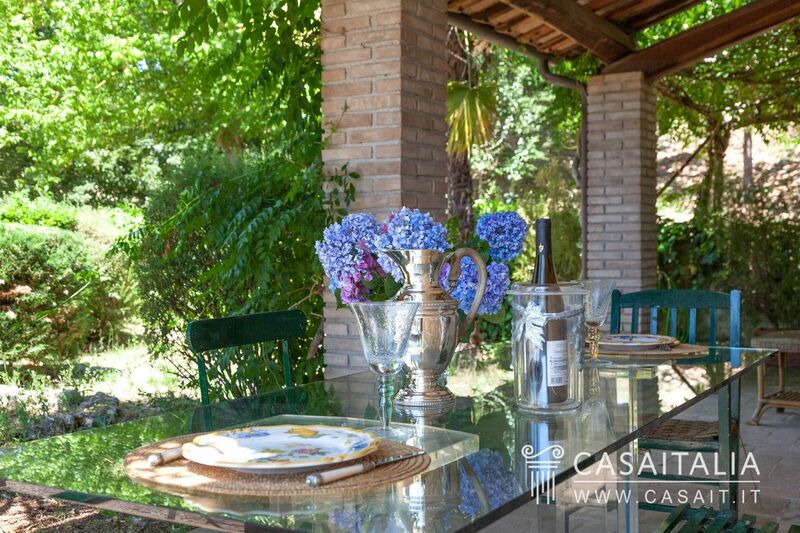 Situated in a convenient and secluded location, the property is ideal as a holiday home for those in search of a manageable-sized property which is not too much work. 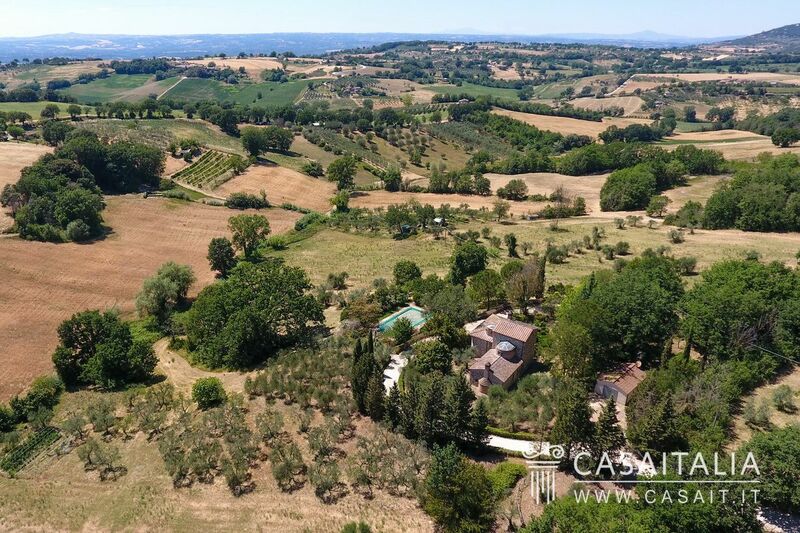 Its proximity to Rome and its international airports, reachable in just over an hour, make it perfect for those who want to spend relaxing weekends and short breaks in contact with nature.